I've heard the subject of "no buy" or "low buy" come up recently. I've seen it on Facebook groups, and it's been a conversation I've had with a friend. It's definitely an issue we all face as nail polish addicts, and difficult one at that! This is certainly different for every person, as we all have different budgets, lifestyles, and will-power. I no longer put myself on no buy. I actually haven't felt a need to recently, that's not to say I haven't come across times I need to cut back. I put myself on low buy. I buy less and less often. No buy though? I couldn't do it. I commend those who have! I remember when I first got into polish I was making 3-4 times a week trips to CVS and Walgreens to go buy nail polishes. This does not happen at all anymore. I think I only stop at CVS or Walgreens maybe once every 3 weeks, and even then I may only get 1 or 2 polishes. The same can be said for Ulta and Sally's. I only go to Ulta or Sallys maybe once very 2 months, and max I'll buy maybe 3-4 polishes. 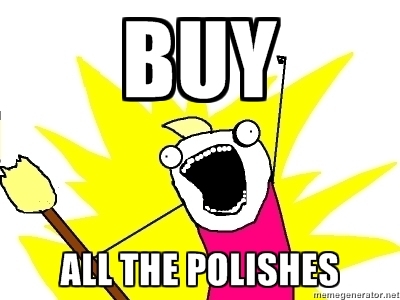 Online polish purchases from e-tailers used to be a huge deal for me when I got into nail polish. I'd place orders on etailers for 10-12 polishes every other month. Now, not so much. Online purchases from indie brands.... that's a little harder to curb. I do find myself purchasing an 3-4 indie polishes per month. I make that my limit. Mind you, the week of my birthday, I went back to my prior polish spending days. I hauled a bit a Sally's, Walgreens, and placed an order from Jade holos and Hits Phenomena polishes on Ninja Polish. It was my birthday though, so special occasions don't count! Overall, I think I do pretty good with my polish purchases. Is it perfect? No. I still will impulsively buy something on occasion, but that has gone down a lot. How am I able to quell my impulse to buy lately? 1. I avoid. I honestly pretend a lot of stuff doesn't exist. For instance, I never bought a single Brazilian polish until last month. They've been easily accessible for a long time and as gorgeous as ever, but I just put them out of sight and out of mind. I may see them on a blog, but I put it in my head that it's not an option now. I can say the same for those huge indie brands like Dollish Polish for example. Amazing polishes, but they're so unobtainable I don't even bother. 2. The urgency to purchase has diminished. The thrill of finding something and purchasing it or finding it first doesn't do much for me anymore. I saw the new OPI Germany collection at Walmart last week. I had not seen it in person yet, and I got that little spark of "OMG WANT!". I had to remind myself that this collection is not going anywhere for a few months. It will be somewhere 2 weeks, next month, and probably the month after. Lately, new collections I'm buying polishes from have already been out for over a month. The extra time also helps me realize what I really want in a collection. 3. When will I actually swatch this or wear this? I'm not painting my nails as much as I used to, so I'm not going through as much polish. I get backed up on swatches, and that often means quite of few of things I buy may not get worn until month to months later. It just doesn't seem practical to buy something that may not see the light of day for awhile or at all. 4. Been there done that. I think a lot of our go-to brands like OPI, Zoya, Essie, China Glaze are putting out a lot of similar collections with similar colors. Do I really need 5 versions of plum and navy blue? 5. Picky Picky. If there is something not extra special or unique about a polish I'm most likely going to pass it over. I will search colors on my phone, look for dupes, and really convince myself I don't need it. These are just things that have worked for me. I think a lot of it also has to do with how long I've been into polish. I love polish, but it's not a new thrill for me. I've got a feel for how things sell and what I really will use and enjoy over time. The indie movement has definitely been the hardest to resist, but I've been able to keep those purchases to a minimum. I think little splurges here and there are fine. I just bought Humble Bee on Ninja Polish since I found out it was still available. If you have the budget to spend on a lot of polish that's fine too, but if you don't remember your priorities and stop a think first! What are your experiences with the impulsive need to buy polishes, no buys, low buys, and anything else on this subject? I avoid doing no buys because there is no such thing. If i come across something and i want it i'll buy it, plus if you put a ban on something it just makes you want to buy it so much more. Since buying a house and fixing it up i've been really good about not buying polish but now after some of the dust has settled i'm back to being really bad and spending more than i should but in the end you just gotta do what makes you happy and what is reasonable for your budget! Excellent post. I am also thinking of challenging myself to a core 100. Reduce my polishes from many hundreds to just ONE hundred. And if I buy a new one then another one must go. I've noticed that I binge. I don't seem to care about drugstore polishes or snatching up the newest collection for a few months, and then all of a sudden I buy everything I've been wanting or thinking about for the last month or two. It is getting better though. And like you said, I try hard to make sure that there is something about a color that I really don't already have in my collection before I buy it. I am proud of myself for not buying into all the hype around full priced designer brands. I've only sprung for DLs at full price once, and it was "for my birthday." I can't justify the prices. I have a hard time buying Butter Londons because of that too. Great article. I too am so backed up on swatches it's hard for me to desire wanting to add to the mayhem unless it's something INSANELY unique which in a collection like mine (and yours) is hard to come by! I just posted a topic similar to this on my blog. I am just hitting the point right now where I decided I want to be more picky and not jump at something just because it's in a new collection, everyone is talking about it, or that it is on sale. I love looking at the new collections and watching for swatches and comparisons so I can make an informed decision about whether or not it is unique to my collection. I'm sick of all of the polishes I have that I just bought to buy and I don't really enjoy - I hit a breaking point this weekend and started going through and decluttering. I agree - the indie polishes are hard to ignore. They are everywhere and all of them are so unique. With those, I make a list of ones that I like and read blog posts, etc., and think about it for a while. Sometimes I forget about them, but other times I finally make up my mind that I NEED them:) I should probably make a limit per month because I am starting to get a little carried away. Thanks for the tips, I'll be sure to use them! Great post!! I've never put myself on a no-buy either because I've never seen the need but I've pretty much been on a casual low-buy for the past year or so. When I first got into polish, I had to have everything and would buy tons and tons of polish haphazardly because I had the mentality of 'need all the pretties.' I got excited for every new collection that was coming out and would buy the whole darn thing! But now that I have been in it for awhile and have all the basics covered, I really only buy what I think is really unique and special. For example, I collect vintage polishes and only buy if I find a super HTF one that I have been looking for for awhile. In terms of new polishes that come out, I don't get too excited over new collections anymore and just buy the ones I really like. Oh my gosh, I wish I had such will power!!! I've never been on no-buy or even on low-buy, I know I would never last longer than a week!!! Since I started doing comparisons though I am finding myself purging my stash of the dupes or almost dupes. Not like it helps though, I keep finding all these awesome new brands (Enchanted Polish anyone???) that I just cant help myself!!! What can I say, I'm a true crackhead when it comes to nail polish! I'm still relatively new to nail world and I do not have a big collection (less than 200) but I'm finding myself already burned out on a lot of the new collections. Not that I don't want them or find them gorgeous, but I'm holding back until I find something that's special or unique. Also, the fact that there are some colors I don't wear or buy (reds, pinks, oranges) only limits my choices more. I say I'm on a no buy right now because I barely have any income at the moment. While it is hard to resist, I know I don't have money to spare for nail polish. Indies are definitely my weak point and I'm kicking myself on the ones I've already missed but, sadly, life comes first. Plus, I also have so many untrieds right now that deserve love! I agree with everything you said! Its basically what I do. I also stopped buying polish *just* because it was on sale. Ulta was the worst, cause its so hard passing up a Zoya that's only $2.99....but really, would I ever where the color? No! I only buy colors I like or love in the bottle. I have bought quite a few recently, but only because I had been wanting them for years and I finally had the extra cash to allow me to make the purchases. Luckily for me I never feel the impulse to purchase whole collections plus I myself am pretty picky. It has to look unique; it has to grab my attention big time. I find that I only have problems when there are sales and I mean serious clearance sales. For example, I have never purchased China Glaze for more than $1.50 and I have only purchased 4 O.P.I. 's at full cost ($8.50). Anyway, those clearance sales are the times when I find myself impulse buying any nail polish I see that looks remotely interesting. My polish collection consists of roughly 265 or so and that has been from occasional purchases over a 7 year period. I have noticed though I go through cycles where I go through nail polish like a fiend changing my manicure every three days! I have found that those moments occur when I love the appearance of my nails (toes and fingers). Anyone else notice that about themselves? Awesome Talk It Out Tuesday, Steph! I think I went through the same transition as you described: when I first became enamoured with enamel (hah!) I was buying tonnes of polish all at once, both in the drugstore, as well as online. I thought I HAD to have every unique polish ever made. Now I've scaled back for the same reasons you've described. Most especially I just feel like I've seen most polishes before, or at least something close to them. This weeds out a lot of lemmings in seasonal collections from big nail polish companies (there are always about three reds and a few pinks in each OPI collection it seems). I do struggle with curbing my order of indie polishes- I can't get enough of them! I've found I've naturally gravitated to "low buy" over time, because I look at the new collections and think "not only do I have something very similar, when was the last time I wore it?". I remember my polish drawers and how even though I'm not buying very much I've still got a bunch I've never worn. Having said that, if something calls to me, even if it is similar to what I have, I go for it. (This explains the large number of purple shimmers I have - I can't resist their siren call.) The polishes I have are, on the whole, not particularly expensive, and as my husband says, it's cheaper than therapy. The last time I bought more than one or two polishes at a time was when I was on a trip to a state which has CVS stores and their exclusives, but even then I'd researched which ones I wanted, was armed with a list, and decided against a couple because I didn't like how they looked in the store. This is why your blog and others like it are really important for me - because sometimes I do have only one chance at these polishes so it's good to know ahead of time if it's worth it. The indies are the easiest to resist - it's work to order online, it gets expensive with shipping, and the vast majority of them seem to be glitter top coats, which I know I hardly ever wear because even with the foil method they're a pain in the patoot to remove. This. Exactly. Except my weakness is teal and turquoise instead of purple. I feel the same as you - I haven't felt the need to buy lately and this mostly comes from me moving and not having a house/address at the time. It really helped me curb my obsession a bit. Just like you, when I first got into polish I would buy buy buy from everywhere, like 5-10 polishes at a time... then I moved on to ordering online... then I moved on to indie polishes. I haven't purchased a polish since July 13th so almost a month for me! If I see something I absolutely love, I'll buy it. But honestly, when I started going through my collection as my move came around and got rid of nearly 100 polishes... I knew there was no reason to have that much because I didn't even wear or try half of them. Crazyyyy to think about! I agree that being picky over an item having something special about it is one of the best ways to cut back. EXACTLY this. You've summed up my NP experience over the past couple of years (wow has it been that long already??!). At first I was always on the hunt, and acquired many things quickly. Passing a new drugstore would give me a thrill. But now I'm very "Been there done that" with new collections. I have gotten rid of a bunch of polish over the last few months, mostly colors I bought in the beginning and would never wear now. I do love evaluating all new collections, and maybe getting 2-4 from each if they seem unique and I'm certain I'll wear it more than once. And I still pop into a dusty every now & then, if it looks friendly. that said, i am going to buy every single one of the upcoming color club & china glaze holo collections. knowing this helps me save my money for a rainy day. "do i need another opi vamp when there's an entire collection of holos coming out in two weeks?" Great post! My nail polish obsession is still fairly new so I'm still tempted to buy all the polishes, hehe! I think I'm a low buy too though. I try to be careful with my spending so I usually limit myself. Although I admit new polishes tend to sneak their way into my cart at Target more and more lately. ;-) To help with that though I also try to stick to buying colors I need. Occasionally I'll splurge and buy a more expensive polish but I usually try to stick with the more affordable ones. I started the Polish Project on my blog when I realized I had collected well over 100 polishes and probably hadn't tried at least 1/3 of them because I got caught up in the polish hoarding. http://www.jamiesanford.com/category/polish-project/ is where I am trying to test everything before buying. It has mostly worked, but I could not resist OPI's Number One Nemesis, or clearance events at CVS and Sally Beauty. However, the overall drop in polish buying has been astounding. My mission to try all of the ones I have out has been really fun. I keep nodding and saying "yes!" as I read this post! That's exactly how I've been staying on my low-buys for the past few months. It really helped to keep my stash from exploding! lol! I totally need to put myself on a budget. I buy way too much. I want to have a blog sale but I have 2 nieces and a sister who are like give them to me but the whole purpose of the blog sale is to replenish the bank for new polish. This month I am buying a PayPal card to deposit into my acct and when the money is gone that is it. I'll just have to wait till the next month because my spending is out of control.